It probably seems like yesterday that your shiny new IT system was setup and performed all sorts of wonderful tasks that helped your business run as smooth as clockwork. The sad truth is all good things eventually must come to an end, and your IT setup will only have a limited life span. Once your systems become buggy, slow and can’t keep up with the latest software, it’s only a matter of time before it starts causing you major problems. Cyber-attacks are the biggest threat to UK businesses with new attacks coming out every day, and old set ups simply can’t keep them out. To remain fully operational you should be think about replacing your Computers every 3 to 5 years. With computers, prevention is far better than cure as we rely so heavily on them. If you adopt a “head in the sand” approach and opt to just risk it, you will almost certainly end up regretting that decision. So, how can you tell that your current IT Set Up is on its last legs? It can’t update to the latest operating system. If you’ve ever tried to run the latest update on an old iPhone you’ll know what a pain it can be. Software used to update every few years, but in today’s fast paced world they can be every few months. Failed updates means frustration, added costs & lost productivity. You’ve been successfully targeted by a cyber attacker. An increase in dubious emails & viruses is a sign that your set up can’t cope with modern threats. With cyber-crime at higher levels than ever before, this is something you simply can’t afford to ignore. It’s running out of disk space. There’s only so much storage space any physical IT set up can handle, and if you’re struggling to save documents it’s only a matter of time before your business is going to suffer downtime. It’s slow. Like the poor old family dog, over time computers run out of energy and simply can’t keep up the pace. If you’re experiencing bugs, lags and it takes an age to perform a simple task, your computers are trying to warn you that they need a well-earned rest. You’re spending more time trying to fix it than you are using it. 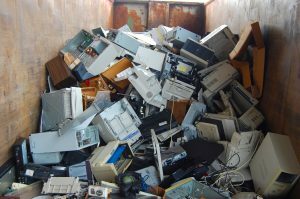 A computer system that’s on its way out is a huge drain on your resources. If you’re finding yourself cursing your PC or constantly on the phone to your support people, it’s probably time to call it a day.